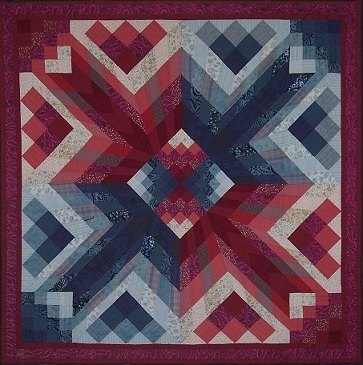 This quilt was designed using a technique called “design fragmentation” described by Jinny Beyer in Patchwork Portfolio. Essentially, if a block is made up of squares and triangles, the squares are divided into smaller squares, and the triangles into smaller triangles..
Cubic Conundrum Migration Just Doodling Spider's Web in Morning Dew Swirling Rapids Roses in Raw Red Jack in the Pulpit Triangle Daydream Dresden Plate Kaleidoskope . Sunset Golden Girl Woven Rainbow 1 3D Folded Flower Memory Quilt Woven Gradation 1 Gemstones Woven Gradation 2 Pineapple Swirl .